Some doubts have been expressed about the notion of rights with regard to the possibility of structural change and within the discourse around liberation and emancipation, notably by feminist writers. Apart from a response to these concerns, the chapter also includes a few practical suggestions for theriocentric education. 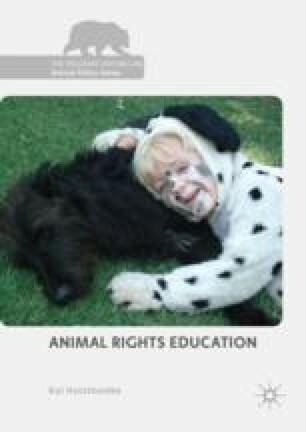 The recognition of animals’ rights and “animal emancipation”—as it is envisaged by ethical individualism, and to which animal rights education can make a distinctive contribution—can be seen to imply “human liberation”, the act of humans freeing themselves from the role of subjugators, from the dominant relationship they have with the rest of animate nature and from dependence on animals at the expense of the latter’s lives, freedom and well-being.